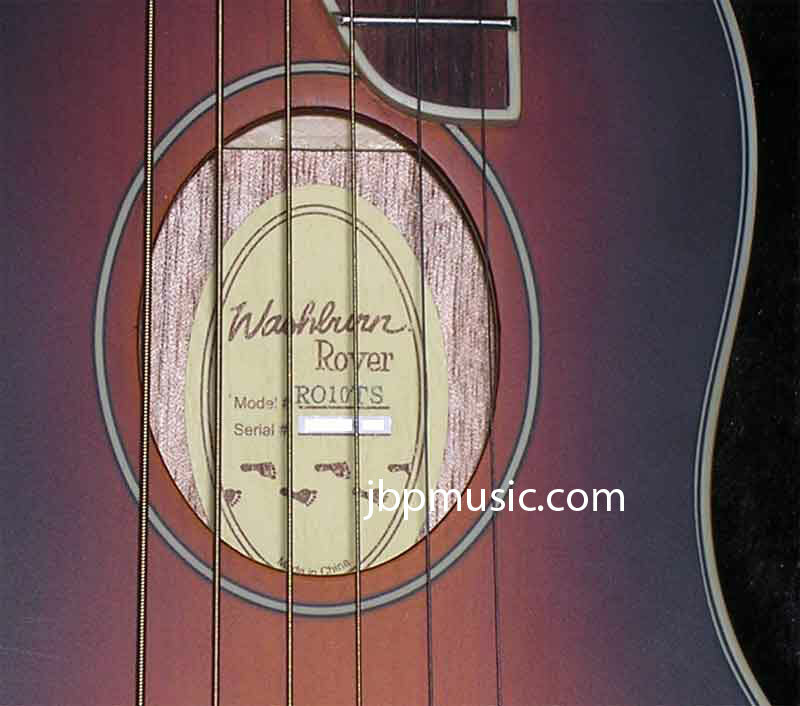 Washburn Rover Travel Acoustic Guitar Review – Still travelin’ with me to this day! I first wrote this review on August 5, 2008. It still travels with me to this day. 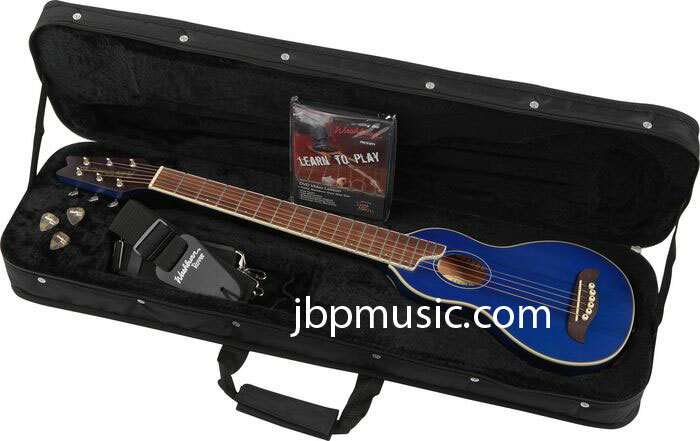 The sturdy case and ease-of-play make it a great way to think and play while you’re on-the-go… Superb! Washburn has been making nice acoustics for years. I’d love to see more from them. Quick Opinion: The Washburn Rover is a good bargain that has lots of nice features, decent build quality, and great playability. I absolutely enjoy playing my Rover – for years now… And it has a GREAT travel case! and GREAT simple old-fashioned butterbean open tuners. Feature-wise, the Rover is rich. It comes with a strap and an allen wrench. It even comes with an excellent lightweight zippered fabric-on-foam case that is very sturdy and very lightweight. I’ve carried mine TONS of places and have never felt bothered by carrying around our Rover (we named it “Rover” – surprised?). It is by far the best bargain for the money, given the features alone. Quality: The quality of my particular Rover is excellent. It rivals most basic acoustic guitars, and even a few middling ones. It isn’t the perfect detail of a Yamaha student guitar, but it is very close. 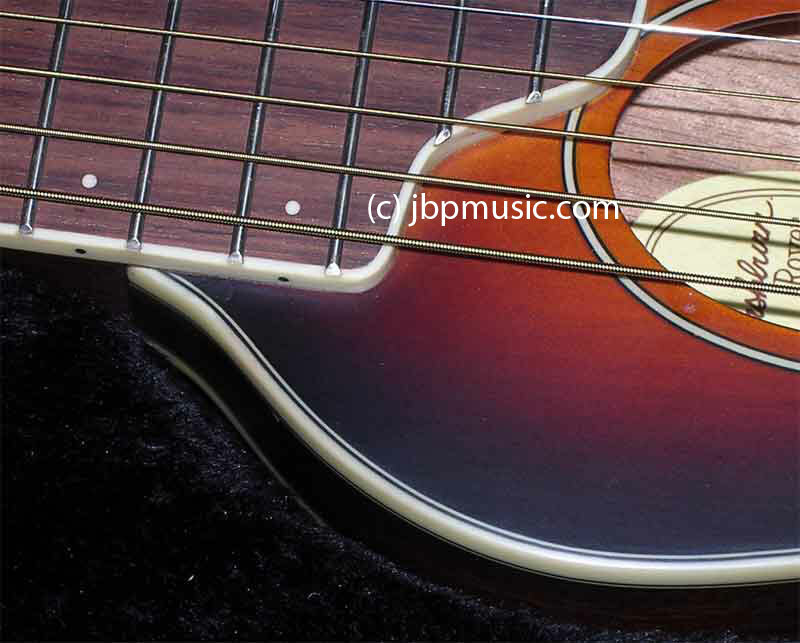 Overall, you will probably find a few flaws in the finish, or a bumple or two in the binding. However, the neck is straight and comfortable, the finish feels really quite good on the skin, the neck is finished very well, and the tuners are actually quite nice. Overall, the build quality exceeds many $300 guitars. Perfect? No. Excellent for its cost? Absolutely. The tuners are the exposed-gear variety. They’re not sealed 18:1 Grovers or super-cool Klusons. They’re basic. However, they stay very close to being in tune the entire time I’m playing on the porch. That’s good enough for me. From an intonation perspective, the Rover is very close to being a near-tempered in-tune instrument. Sometimes you have to sacrifice between tuning for a nice clean D Major chord and a clean warm C Major chord. Using a sweetened tuner like the Peterson StroboSoft or Strobing hardware tuner makes things sound better. Playability: From the perspective of action, neck feel, and string spacing, the guitar plays awesome – just like a champ. Close your eyes and your fretting hand won’t know it is holding a little travel guitar. The action is as smooth as butter (I like 11s in some sort of bronze, usually Ernie Ball Earthwoods of some sort or Martin phosphor bronzes.) It really plays much easier than my larger guitars. The downside? With any tiny-body guitar (not just the Rover, but all of them), you can’t sit it on your leg and relax sitting down with it. If you want to be comfortable and not have to clamp the guitar to your chest, install the included canvas strap. 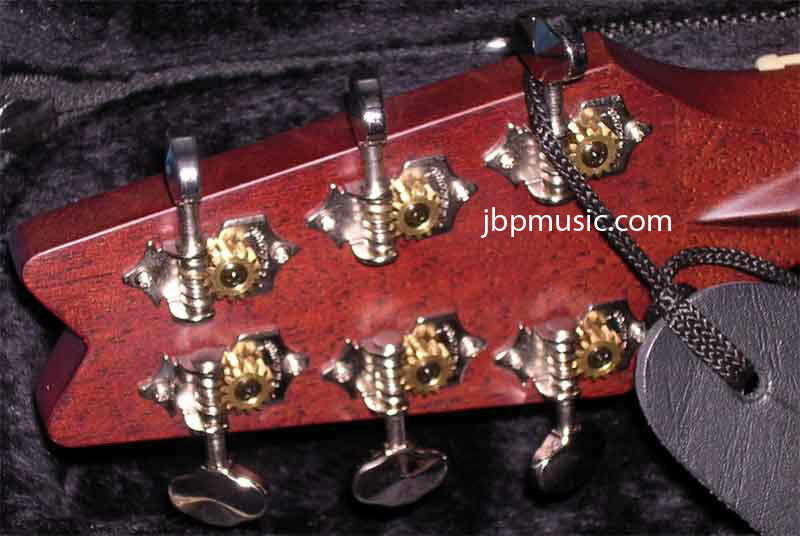 Once the strap is on and around your neck, the guitar actually plays pretty effortlessly. If you don’t wear the strap, you’ll find yourself fiddling with it all the time (no pun intended, or, maybe pun intended?). 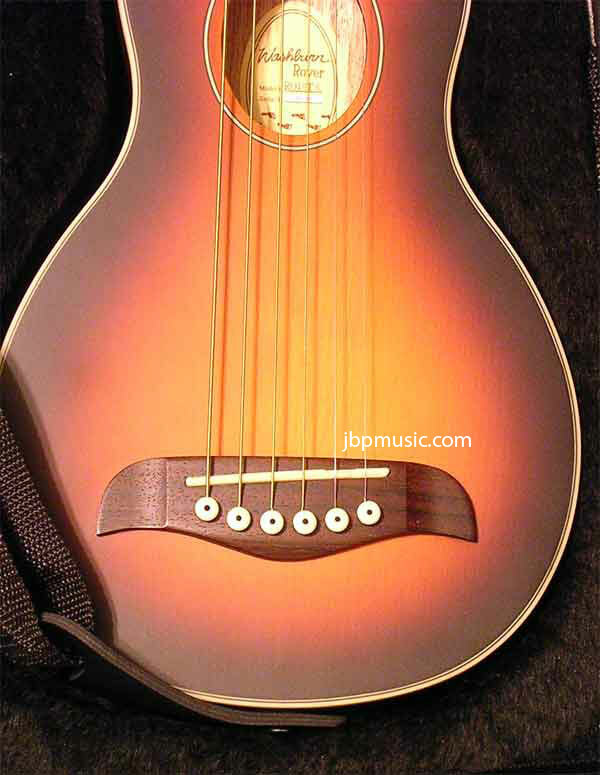 Sound: I’ve played tons of travel acoustic guitars. Plug-in electric-earbud guitars, very inexpensive no-name imports, and some from the very big brand names. I love the Martin, truly… but the Rover is warmer and less tinny sounding. Even though I’m a huge Martin and Taylor fan, the little Washburn won my ears over immediately. So, what does it sound like? It sounds like a really nice guitar that is played back through an inexpensive stereo with little bitty speakers. It is fun, not too hard on the ears, and actually has an admirable flavor and character. Bear this in mind: none of them sound big, boomy, warm, and growly. The Washburn Rover is definitely the best of them (in the low-cost range). The Rover actually is more warm (with 92/8 phosphor bronze strings) than some of the expensive boutique travel guitars. The strings REALLY make a difference. Don’t cheap out on the strings. Just don’t expect it to sound like my Big Baby Taylor or my cedar-top Tak. Value: The value exceeds its current $149 price. It is less expensive than its cousins and even comes with a good case. It is definitely worth much more. It is a high-value, very fun-to-play instrument. Wishes: Washburn already answered my one wish for this: They now come in neat transparent colors and a new natural and a new blue color. This entry was posted in Acoustic Reviews, Guitar Review and tagged acoustic, guitar, review, rover, travel, washburn by Jim of Vivid Peace. Bookmark the permalink.